Another mass-market hotel for South-Kings Cross. Another big hotel chain is settling in the Southern part of Kings Cross. 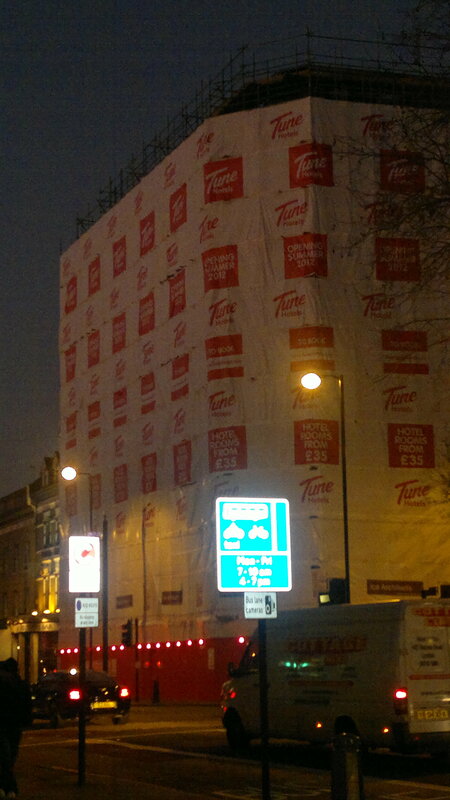 The corner of Gray’s Inn Road / Swinton Street currently experiences the erection of a massive sized hotel of the Tune chain, a South East Asian group that has the majority of its hotels in Malaysia. The group prides itself to give “a five-star service at one star prices.” The hotel will open later in 2012 in what I believe was the former 1930s nurses home adjoining the 19th century Central London Throat Nose & Ear Hospital, parts of which still operate as a hospital. The Southern part of Kings Cross has seen a strong increase of new tourist accommodating facilities, mainly of the low-budget type. These included two Clink hostels, one in Grays Inn Road and the other one occupying a beautiful national heritage protected former magistrate-court on Kings Cross Road and a Travelodge that occupies the pretty 1910 Willings House on Grays Inn Road. The arrival of the new hotels / hostels have at times also brought more noise into the streets mainly by drunk tourist groups finding their ways back to the hotels late at night or early mornings. But on other occasions the tourists themselves have been seen to fall victim to aggressive begging activity or local drunks. Alongside the hotel developments, the presence of shops trying to profit from tourists has also risen. These include off licences, take-aways, caffs and coffee-shops. What the impact of these would be is very difficult to predict. Many of us have seen Kings Cross at its worst in the 70s and 80s, and some positive developments since the Eurostar opened. What one can perhaps ask for is that parallel with any increase in people who are in the area very temporarily and businesses such as hotels and hostels who facilitate this, Camden Council and the local new big businesses ought to commit themselves to permanent, consistent sustained community investment. Anything from supporting local communities and initiatives to improve the surroundings (sponsored street flowering, cycle stands, electric vehicle charging points etc…) or to part-assist local projects such as the struggling Calthorpe Project, or some of the nurseries and elderly facilities serving the area. For the hotels another such way would be to give limited access to conference rooms free of charge for community groups and events and residents’ meetings, perhaps well reduced fees for bookings by local residents ( either to accommodate these residents’ guests or for party room bookings). And of course we the residents also have obligations. I always make a point of helping lost tourists trying to find their way. It is my method of showing them that Kings Cross is a friendly place where people help each other. Over the years I have acquired a good knowledge where most of the hotels are. I am always weary that there was a time not so long ago when tourists were warned by the hotel’s reception staff not to speak to locals around Kings Cross (I am not making this up). My message therefore also to the temporary sojourners: Can I be of help? Let’s hope the Tune chain will be in tune with our warm-hearted Kings Cross community. 1 Response to Another mass-market hotel for South-Kings Cross.